The 2018 ICC World Twenty20 2020 Sub Regional Qualifier is coming to Morrisville! Along with the International Cricket Council (ICC) and USA Cricket, the Triangle Cricket League will host the Sub-Regional Qualifier for the 2020 Cricket World Cup at Church Street Park in Morrisville, NC from September 19 through September 26. 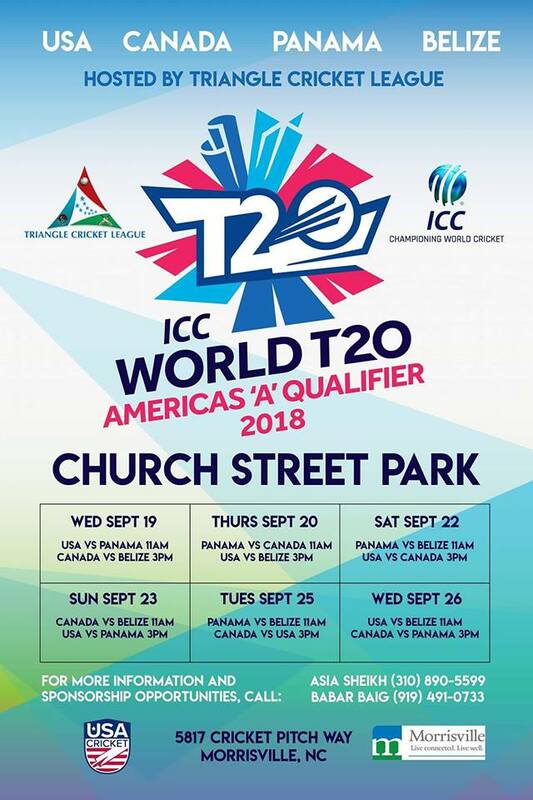 The United States, Canada, Panama, and Belize national cricket teams will compete over the course of the week in a round robin, with two teams advancing to the Americas Regional Qualifier and compete against Bermuda and the Cayman Islands. The schedule for the tournament can be found by clicking here. The United States roster can be found by clicking here.